And so it happened again: For the fifth time since 1986, the "great religions of the world" descended upon Assisi, Italy, gathering from Sep. 18-20, 2016, at the basilica of St. Francis and the surrounding area in order to come together and deliver endless Naturalistic platitudes about luv, encounter, dialogue, mutual respect, and human dignity -- nothing you wouldn't also find on a Hallmark card --, all as supposed "keys" to peace. Oh, and prayer of course. Not orthodox prayer to the only true God, mind you, but just any sort of lifting of the soul to someone or something one considers to be divine, each in accordance with his own beliefs, preferences, and ideas. At this event, each religion was invited to perform its own "sacred ritual" and hold its own prayer service, without distinction: "Christians", Muslims, Jews, Buddhists, Hindus, Sikh, "traditional religions" (a euphemism for some Heathen religions such as Voodooism), and so forth. Just as at prior Assisi meetings, the different religions were given separate spaces in and around the sacred convent to perform their sacrilegious, idolatrous, and blasphemous rites. That is an abomination before God, who declares in Holy Scripture, "Adore not any strange god" because He is "a jealous God" (Ex 34:14) and "all the gods of the gentiles are devils" (Ps 95:5). But the Word of God was not in demand at this event -- the word of man was much preferred. Dearly beloved, believe not every spirit, but try the spirits if they be of God: because many false prophets are gone out into the world. By this is the spirit of God known. Every spirit which confesseth that Jesus Christ is come in the flesh, is of God: And every spirit that dissolveth Jesus, is not of God: and this is Antichrist, of whom you have heard that he cometh, and he is now already in the world. You are of God, little children, and have overcome him. Because greater is he that is in you, than he that is in the world. They are of the world: therefore of the world they speak, and the world heareth them. Alas, the warning against false prophets, found in numerous places throughout the New Testament, has fallen on deaf ears in most people. If a false prophet puts on a big smile, says something in favor of the poor and the suffering, caresses the disabled, and kisses babies, most people are in ecstasy and cannot imagine how such a man could possibly be evil. It is pathetic, but that is the depth of most people's "faith" today. They have forgotten that the wolf clothes himself in sheep's skin so as not to appear as a wolf (cf. Mt 7:15), just as the devil disguises himself as an angel of light (cf. 2 Cor 11:14), lest people, realizing he is the devil, should fail to be deceived. Just look at Mother Teresa. The woman was a public apostate who denied Jesus Christ and mocked His Gospel, but everyone thinks she was a saint. Similarly, no matter how much you have convinced people that the Vatican II Church is a demonic sect from hell and not the Catholic Church, at the first rumor of a "Eucharistic miracle" in the Novus Ordo, they are tempted to flock back to the Modernist religion. These people have not understood our Lord's warnings: "Then if any man shall say to you: Lo here is Christ, or there, do not believe him. For there shall arise false Christs and false prophets, and shall shew great signs and wonders, insomuch as to deceive (if possible) even the elect. Behold I have told it to you, beforehand" (Mt 24:23-25). You won't find anyone at the Vatican promoting this encyclical any time soon. And if you are one of those people who labor under the illusion that "nothing has changed" since Vatican II, we encourage you to go to your local Novus Ordo parish and ask if they will let you pass out a copy of this encyclical to every parishioner at the next "Mass". Good luck. Although the immediate context in which Pope Pius is speaking here is that of ecumenical assemblies among people who profess belief in Jesus Christ, this does not diminish the argument. On the contrary, it makes it stronger, for if such things are not permitted to be done amongst people who claim the name of Christian, how much less permissible must it then be among people of all religions and none! What happened in Assisi on September 20, 2016, will in no wise bring peace but the just wrath of Almighty God, which can only mean more war, strife, and bloodshed. The lamentations of the prophet Jeremias are applicable here: "And they healed the breach of the daughter of my people disgracefully, saying: Peace, peace: and there was no peace" (Jer 6:14); "We looked for peace and no good came: for a time of healing, and behold fear" (Jer 8:15). The Naturalist drivel at the Assisi gathering was unbearable. It reached its zenith in the closing ceremony. That we would hear odes to Naturalism from the mouths of people who are not and do not claim to be Catholics, is not surprising. But that such would gush forth also from the lips of those who call themselves Roman Catholics and are officially recognized by the world as such, that is the real scandal, the real tragedy, the real spiritual crime. Chief offender in this regard was, of course, the world's apostate-in-chief, Jorge Bergoglio, otherwise known by his stage name "Pope Francis". But the other "Catholic" speakers, too, happily expressed their apostasy. The world will experience a phase of development if those who [are] here do not search for glory, do not regards [sic] themselves as better than others and do not consider their own religion, their own group or their own culture as superior to the others'. The one who stands before me has always something more than I have, something I do not possess. This is a direct denial of the Gospel, of the uniqueness of the Catholic Church, of the rights of Christ the King, of the necessity of the Church for salvation, and of virtually everything else that is Catholic. Gambetti makes Christ equal to the demons. He spits on the clear and divinely-inspired words of Pope St. Peter: "This [Jesus Christ] is the stone which was rejected by you the builders, which is become the head of the corner. Neither is there salvation in any other. For there is no other name under heaven given to men, whereby we must be saved" (Acts 4:11-12). "Oh, but religious differences divide people!" you say. Yes, they do. That's why our Blessed Lord is called a "stumbling block" (1 Cor 1:23; 1 Pet 2:8) who is also "the head of the corner"; that is why Simeon prophesied that "this child is set for the fall, and for the resurrection of many in Israel, and for a sign which shall be contradicted" (Lk 2:34); that's why our Lord Himself declared: "Do not think that I came to send peace upon earth: I came not to send peace, but the sword" (Mt 10:34). Such is the nature of the Gospel: It splits the world into two camps, the believers and the unbelievers. "He that believeth and is baptized, shall be saved: but he that believeth not shall be condemned" (Mk 16:16). The Gospel will forever be a sign of contradiction; it will forever separate the wheat from the chaff, the sheep from the goats (cf. Mt 13:30; 25:32-33). If Francis and his gang don't like that, they should at least have the decency to cease calling themselves Catholic. "But though we, or an angel from heaven, preach a gospel to you besides that which we have preached to you, let him be anathema" (Gal 1:8). "Thirst for Peace" was the title of this fifth meeting at Assisi. To a world that thirsts for peace, it is the duty of the Vicar of Christ -- such as Francis claims to be -- to offer the "living water" of Jesus Christ (cf. Jn 4:10), which alone has the power to bring salvation and true peace to the world. But not surprisingly, Jesus Christ was only mentioned during the ecumenical "Christian" part of the event (although not by Francis), not during the concluding ceremony, where adherents of all religions and none (even atheists!) were present. But what is the true answer? What is the Catholic way to peace? ...We turn affectionately to all Our children and conjure them in the name of Our Lord Jesus Christ to forget mutual differences and offences and draw together in the bonds of Christian charity, from which none are excluded and within which none are strangers. We fervently exhort all the nations, under the inspiration of Christian benevolence, to establish a true peace among themselves and join together in an alliance which shall be just and therefore lasting. And lastly We appeal to all men and all peoples to join in mind and heart with the Catholic Church and through the Church with Christ the Redeemer of the human race, so that we may address to them in very truth the words of St. Paul to the Ephesians: "But now in Christ Jesus you who sometimes were afar off, are made nigh by the blood of Christ. For He is our peace, Who hath made both one, and breaking down the middle wall of partition . . . killing the enmities in himself. And coming he preached peace to you that were afar off and peace to them that were nigh" [Eph 2:13ff.]. The reason why only the peace of Christ is genuine and true peace, and why it cannot be obtained in any other way except by submitting to the sweet yoke of His law and Gospel (cf. Mt 11:30), is that divine grace is needed to aid us in our human condition, to overcome our sins, perfect our nature, and make us virtuous so that we may bear wrongs patiently, forgive our enemies, and do good to those who hate us. Naturalists like Francis and the entire Modernist Vatican II crowd, however, do not believe this, because they deny original sin and its effects and hence also its divine remedy. They believe that it is possible to eliminate strife and quarrels among individuals and nations by merely natural means, by dialoguing, by hugging, by playing soccer, by planting trees, by lighting candles, by trying to be a better person -- all without the grace of Almighty God. They seek a Naturalist brotherhood among men, a kind of "super-church" that is more universal than the Catholic Church, that seeks to embrace and unite all people, but not in the Kingdom of Christ but only in the kingdom of man. Yet, our Blessed Lord was very clear: "Peace I leave with you, my peace I give unto you: not as the world giveth, do I give unto you" (Jn 14:27). No, Venerable Brethren, We must repeat with the utmost energy in these times of social and intellectual anarchy when everyone takes it upon himself to teach as a teacher and lawmaker - the City cannot be built otherwise than as God has built it; society cannot be setup unless the Church lays the foundations and supervises the work; no, civilization is not something yet to be found, nor is the New City to be built on hazy notions; it has been in existence and still is: it is Christian civilization, it is the Catholic City. It has only to be set up and restored continually against the unremitting attacks of insane dreamers, rebels and miscreants. OMNIA INSTAURARE IN CHRISTO [to restore all things in Christ]. Oh, how different this is from the false gospel according to Francis! Too bad that Francis refuses to preach the Prince of Peace (Is 9:6) to those of "all faiths" as the only genuine remedy. No, the devil does not want to "kill everyone", at least not physically. The devil seeks the eternal ruin of souls, not the physical destruction of the body per se. All of us will die before long anyway, so our physical destruction is guaranteed (cf. Heb 9:27). It is, in fact, a divine sentence in punishment for original sin: "For the wages of sin is death" (Rom 6:23; cf. Gen 2:17). For the devil there is no need to accelerate our physical demise, at least not of those who are bereft of sanctifying grace, for the longer an impenitent soul is alive, the more sins it commits, and if it dies in this impenitence, it will have to endure an eternal punishment all the more severe. No, the devil is interested in much higher things than merely earthly destruction: "And fear ye not them that kill the body, and are not able to kill the soul: but rather fear him that can destroy both soul and body in hell" (Mt 10:28). But for a Naturalist like Francis, who preaches the "Gospel of Man", this is all unintelligible. For him, the temporal world is all there is and all that matters. That's why he only cares about soup kitchens, not about religious instruction. So, no, it is not necessary, as Francis maintains, "for all faiths to pray, even cry for peace" -- rather, it is necessary for all souls to submit themselves to the sweet yoke of the Gospel, so that grace may flourish in their souls and, the spirit of enmity having been subdued with God's help, true brotherly love can rule in everyone's hearts. That would be the Catholic position. One notable occurrence in this Assisi event was that Francis denounced paganism -- not, of course, the paganism of the pagans he had invited and that were gathered next door from where he was speaking, but, as usual, only a metaphorical "paganism of indifference". Buzzwords like this are Francis's specialty, as they make for great newspaper headlines and, being wonderfully vague, convey nothing definite and are too elusive for rigorous theological evaluation. This is the same Francis who also likes to denounce every kind of metaphorical idolatry under the sun -- the idolatry of money, of ideas, of immanence, etc. -- except the literal idolatry of, you know, actual idolaters, like Hindus and other Pagans. No, when it comes to that kind of idolatry, Francis' tune changes. He then calls it "meeting God in different ways". Bergoglio's double standard and blasphemy are sickening. As Fr. Michael Muller once made clear, "It is impious to say, ‘I respect every religion.’ This is as much as to say: I respect the devil as much as God, vice as much as virtue, falsehood as much as truth, dishonesty as much as honesty, Hell as much as Heaven" (source). We must respect people but not their false religions. Our duty is to preach Jesus Christ to them, who said: "I am the way, and the truth, and the life. No man cometh to the Father, but by me" (Jn 14:6). He alone is the way of salvation, and His true Catholic Church alone is the ark in which everyone must gather if he wishes to be saved: "Faith orders Us to hold that out of the Apostolic Roman Church no person can be saved, that it is the only ark of salvation, and that whoever will not enter therein shall perish in the waters of the deluge" (Pope Pius IX, Allocution Singulari Quadam). That nobody in the Vatican believes this, least of all Francis, is obvious. The first sign or mark of this coming persecution is an indifference to truth. Just as there is dead calm before a whirlwind, and as the waters over a great fall run like glass, so before an outbreak there is a time of tranquillity. The first sign is indifference. The sign that portends more surely than any other the outbreak of a future persecution is a sort of scornful indifference to truth or falsehood. Ancient Rome in its might and power adopted every false religion from all its conquered nations, and gave to each of them a temple within its walls. It was sovereignly and contemptuously indifferent to all the superstitions of the earth. It encouraged them; for each nation had its own proper superstition, and that proper superstition was a mode of tranquillising, of governing, and of maintaining in subjection, the people who were indulged by building a temple within its gates. In like manner we see the nations of the Christian world at this moment gradually adopting every form of religious contradiction — that is, giving it full scope, and, as it is called, perfect toleration; not recognising any distinctions of truth or falsehood between one religion or another, but leaving all forms of religion to work their own way. Is this not exactly what we have today? Is this not exactly what the Second Vatican Council brought about as the ideal for every Catholic nation by means of its false and previously-condemned teaching of religious liberty? In one way or another, all the errors and blasphemies of the Modernist Sect can be traced back to that abominable council, called by John XXIII and ratified by Paul VI, which consecrated, as it were, interreligious dialogue and ecumenism. By the way, the prophet Elias once had an interreligious encounter with 850 pagan priests, but it didn't quite go the Vatican II way. Instead of joining up in prayer and declaring that there is more that unites than divides, Elias made it into a competition: He challenged the pagan priests to call on their false gods to send fire from heaven to consume the sacrifice they had prepared, and he would do the same before his God, and then the people of Israel would see whose god is the true one. The story is recounted in 3 Kings 18:19-39 (or 1 Kings 18:19-39 in some Bibles), and it is well worth a read. Francis has endorsed all of these condemned theses -- sometimes more, sometimes less openly. Our Francis Page lists all the evidence. 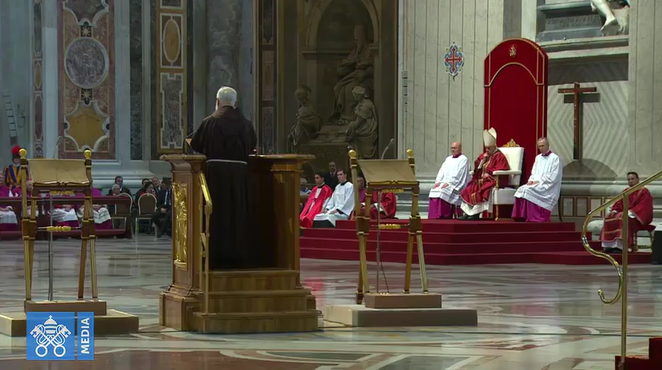 Further on in the same speech, Francis called peace "a thread of hope that unites earth to heaven". With such flowery language, Francis has entertained the masses since his election in 2013. Quasi-poetry like this is perfect for him because it requires no theological knowledge, has no substantial content, and it is anyone's guess as to what exactly is meant by it. At the same time, the media will eat it up because it makes for a great headline. So it's really a win-win for the Novus Ordo cause. Just this one time, however, let us dissect Francis' flowery slogan and see if it can stand up to scrutiny. The kind of peace being promoted and sought at this Assisi gathering was clearly not the peace only Jesus Christ can give, because all religions and none are being encouraged to obtain it in whatever manner they deem fit in accordance with their "sacred" conscience. In other words, it was a Naturalist peace, the peace "the world giveth" (Jn 14:27), not the supernatural peace only Christ can give. So this peace-without-Christ Francis calls a "thread of hope that unites earth to heaven." But even if it were true that this peace could be attained, exactly how would it unite earth to heaven? What does Naturalistic peace on earth have to do with heaven? In what sense would there be a "unity" between heaven and earth? And what heaven are we talking about, anyway? The Christian heaven of the Beatific Vision? The Muslim heaven with the 70 virgins and perpetual fornication? The Buddhist Nirvana? The atheist's idea of being forever and irrevocably annihilated? Just what are we talking about? Likewise, we must ask: What is meant by "hope"? In Catholicism, hope is a theological virtue which disposes us to desire and expect, with the help of God's grace based on His infinite goodness and promises, to attain the Beatific Vision. What, pray tell, does this have to do with the Naturalist "peace" promoted by Bergoglio as supposedly uniting heaven and earth? What is there to hope for if not eternal salvation, next to which any other achievement pales in comparison and becomes utterly irrelevant? True hope exists only in the Catholic religion, not in any other. The Catholic theological virtue of hope is the true thread that unites Heaven and earth. The only thing Bergoglio's false "peace" can unite is earth with hell. As you can see, as soon as one starts dissecting Francis' flowery metaphors using Catholic theology and just common sense, they fall entirely apart. They are nothing but hot air -- and that's bad for the environment, as he likes to remind us on other occasions. In his final address, directed at all the participants at the Assisi event, Francis said: "We have prayed to God, asking him to grant peace to the world. We recognize the need to pray constantly for peace, because prayer protects the world and enlightens it. God’s name is peace." Keep in mind that Francis was speaking to a group of people consisting of representatives of every major religion, including Buddhists, who do not believe in a personal God at all, as well as Sikhs, Shintoists, Hindus, and who knows what else. All this doesn't matter to Francis. To him, "we have prayed to God." And this prayer -- whether it be to the creature or to the Creator is irrelevant to Bergoglio, for him it is prayer as such -- "protects the world and enlightens it". This is a staggering blasphemy! It should not come as a surprise, however, that the man who has explicitly declared that "there is no Catholic God" should instead believe in an uber-god common to all religions and adored by all religions -- the multi-religious "god of peace". No, Mr. Bergoglio! Jesus Christ is the Prince of Peace, He alone is King, and any other "god" is the devil! Oh, the triumphalism! Sacred Scripture is clearly pre-Vatican II. Everyone, pray to Our Lady of Fatima, the Queen of Peace, in reparation for the latest Assisi abomination committed by Francis and his ecumenical, interreligious, anti-Catholic gang. Comfort and console your Loving Redeemer, that He may turn His just wrath from us and bring all men to the light and truth of the Gospel, whence alone true holiness can flourish and the peace of Christ, which is the only true peace, can fill the hearts of men and bring about the restoration of all things in Christ. "And may the God of peace himself sanctify you in all things; that your whole spirit, and soul, and body, may be preserved blameless in the coming of our Lord Jesus Christ" (1 Thess 5:23). And so it happened again: For the fifth time since 1986, the “great religions of the world” descended upon Assisi, Italy, gathering from Sep. 18-20, 2016, at the basilica of St. Francis and the surrounding area in order to come together and deliver endless Naturalistic platitudes about luv, encounter, dialogue, mutual respect, and human dignity — nothing you wouldn’t also find on a Hallmark card –, all as supposed “keys” to peace. Oh, and prayer of course. Not orthodox prayer to the only true God, mind you, but just any sort of lifting of the soul to someone or something one considers to be divine, each in accordance with his own beliefs, preferences, and ideas. When Francis arrived in Assisi on Sep. 20, the last day of the conference, he spent an entire hour greeting each one of the roughly 500 participants individually, including his favorite rabbi buddy, Abraham Skorka. The video of this spectacle can be found in the list of links above. While the three-day conference consisted in large part of topic-based panel discussions not a few, especially on the first two days, the “highlight” of it all was the interreligious prayer for peace just before the event ended, as well as the closing ceremony with numerous speakers, a lighting of two candelabras, and a number of children receiving each the common “appeal to peace” document the various religious leaders had signed. At this event, each religion was invited to perform its own “sacred ritual” and hold its own prayer service, without distinction: “Christians”, Muslims, Jews, Buddhists, Hindus, Sikh, “traditional religions” (a euphemism for some Heathen religions such as Voodooism), and so forth. Just as at prior Assisi meetings, the different religions were given separate spaces in and around the sacred convent to perform their sacrilegious, idolatrous, and blasphemous rites. That is an abomination before God, who declares in Holy Scripture, “Adore not any strange god” because He is “a jealous God” (Ex 34:14) and “all the gods of the gentiles are devils” (Ps 95:5). But the Word of God was not in demand at this event — the word of man was much preferred. Alas, the warning against false prophets, found in numerous places throughout the New Testament, has fallen on deaf ears in most people. If a false prophet puts on a big smile, says something in favor of the poor and the suffering, caresses the disabled, and kisses babies, most people are in ecstasy and cannot imagine how such a man could possibly be evil. It is pathetic, but that is the depth of most people’s “faith” today. They have forgotten that the wolf clothes himself in sheep’s skin so as not to appear as a wolf (cf. Mt 7:15), just as the devil disguises himself as an angel of light (cf. 2 Cor 11:14), lest people, realizing he is the devil, should fail to be deceived. Just look at Mother Teresa. The woman was a public apostate who denied Jesus Christ and mocked His Gospel, but everyone thinks she was a saint. Similarly, no matter how much you have convinced people that the Vatican II Church is a demonic sect from hell and not the Catholic Church, at the first rumor of a “Eucharistic miracle” in the Novus Ordo, they are tempted to flock back to the Modernist religion. These people have not understood our Lord’s warnings: “Then if any man shall say to you: Lo here is Christ, or there, do not believe him. For there shall arise false Christs and false prophets, and shall shew great signs and wonders, insomuch as to deceive (if possible) even the elect. Behold I have told it to you, beforehand” (Mt 24:23-25). You won’t find anyone at the Vatican promoting this encyclical any time soon. And if you are one of those people who labor under the illusion that “nothing has changed” since Vatican II, we encourage you to go to your local Novus Ordo parish and ask if they will let you pass out a copy of this encyclical to every parishioner at the next “Mass”. Good luck. What happened in Assisi on September 20, 2016, will in no wise bring peace but the just wrath of Almighty God, which can only mean more war, strife, and bloodshed. The lamentations of the prophet Jeremias are applicable here: “And they healed the breach of the daughter of my people disgracefully, saying: Peace, peace: and there was no peace” (Jer 6:14); “We looked for peace and no good came: for a time of healing, and behold fear” (Jer 8:15). The Naturalist drivel at the Assisi gathering was unbearable. It reached its zenith in the closing ceremony. That we would hear odes to Naturalism from the mouths of people who are not and do not claim to be Catholics, is not surprising. But that such would gush forth also from the lips of those who call themselves Roman Catholics and are officially recognized by the world as such, that is the real scandal, the real tragedy, the real spiritual crime. Chief offender in this regard was, of course, the world’s apostate-in-chief, Jorge Bergoglio, otherwise known by his stage name “Pope Francis”. But the other “Catholic” speakers, too, happily expressed their apostasy. The world will experience a phase of development if those who [are] here do not search for glory, do not regards [sic] themselves as better than others and do not consider their own religion, their own group or their own culture as superior to the others’. The one who stands before me has always something more than I have, something I do not possess. This is a direct denial of the Gospel, of the uniqueness of the Catholic Church, of the rights of Christ the King, of the necessity of the Church for salvation, and of virtually everything else that is Catholic. Gambetti makes Christ equal to the demons. He spits on the clear and divinely-inspired words of Pope St. Peter: “This [Jesus Christ] is the stone which was rejected by you the builders, which is become the head of the corner. Neither is there salvation in any other. For there is no other name under heaven given to men, whereby we must be saved” (Acts 4:11-12). “Oh, but religious differences divide people!” you say. Yes, they do. That’s why our Blessed Lord is called a “stumbling block” (1 Cor 1:23; 1 Pet 2:8) who is also “the head of the corner”; that is why Simeon prophesied that “this child is set for the fall, and for the resurrection of many in Israel, and for a sign which shall be contradicted” (Lk 2:34); that’s why our Lord Himself declared: “Do not think that I came to send peace upon earth: I came not to send peace, but the sword” (Mt 10:34). “Thirst for Peace” was the title of this fifth meeting at Assisi. To a world that thirsts for peace, it is the duty of the Vicar of Christ — such as Francis claims to be — to offer the “living water” of Jesus Christ (cf. Jn 4:10), which alone has the power to bring salvation and true peace to the world. But not surprisingly, Jesus Christ was only mentioned during the ecumenical “Christian” part of the event (although not by Francis), not during the concluding ceremony, where adherents of all religions and none (even atheists!) were present. The reason why only the peace of Christ is genuine and true peace, and why it cannot be obtained in any other way except by submitting to the sweet yoke of His law and Gospel (cf. Mt 11:30), is that divine grace is needed to aid us in our human condition, to overcome our sins, perfect our nature, and make us virtuous so that we may bear wrongs patiently, forgive our enemies, and do good to those who hate us. Naturalists like Francis and the entire Modernist Vatican II crowd, however, do not believe this, because they deny original sin and its effects and hence also its divine remedy. They believe that it is possible to eliminate strife and quarrels among individuals and nations by merely natural means, by dialoguing, by hugging, by playing soccer, by planting trees, by lighting candles, by trying to be a better person — all without the grace of Almighty God. They seek a Naturalist brotherhood among men, a kind of “super-church” that is more universal than the Catholic Church, that seeks to embrace and unite all people, but not in the Kingdom of Christ but only in the kingdom of man. Yet, our Blessed Lord was very clear: “Peace I leave with you, my peace I give unto you: not as the world giveth, do I give unto you” (Jn 14:27). Why, then, do Francis and his henchmen look for peace “as the world giveth”? Because they have no Faith. They do not believe the Gospel. No, Venerable Brethren, We must repeat with the utmost energy in these times of social and intellectual anarchy when everyone takes it upon himself to teach as a teacher and lawmaker – the City cannot be built otherwise than as God has built it; society cannot be setup unless the Church lays the foundations and supervises the work; no, civilization is not something yet to be found, nor is the New City to be built on hazy notions; it has been in existence and still is: it is Christian civilization, it is the Catholic City. It has only to be set up and restored continually against the unremitting attacks of insane dreamers, rebels and miscreants. OMNIA INSTAURARE IN CHRISTO [to restore all things in Christ]. Here we have, founded by Catholics, an inter-denominational association that is to work for the reform of civilization, an undertaking which is above all religious in character; for there is no true civilization without a moral civilization, and no true moral civilization without the true religion: it is a proven truth, a historical fact…. …But stranger still, alarming and saddening at the same time, are the audacity and frivolity of men who call themselves Catholics and dream of re-shaping society under such conditions, and of establishing on earth, over and beyond the pale of the Catholic Church, “the reign of love and justice” with workers coming from everywhere, of all religions and of no religion, with or without beliefs, so long as they forego what might divide them – their religious and philosophical convictions, and so long as they share what unites them – a “generous idealism and moral forces drawn from whence they can”. When we consider the forces, knowledge, and supernatural virtues which are necessary to establish the Christian City, and the sufferings of millions of martyrs, and the light given by the Fathers and Doctors of the Church, and the self-sacrifice of all the heroes of charity, and a powerful hierarchy ordained in heaven, and the streams of Divine Grace – the whole having been built up, bound together, and impregnated by the life and spirit of Jesus Christ, the Wisdom of God, the Word made man – when we think, I say, of all this, it is frightening to behold new apostles eagerly attempting to do better by a common interchange of vague idealism and civic virtues. What are they going to produce? What is to come of this collaboration? A mere verbal and chimerical construction in which we shall see, glowing in a jumble, and in seductive confusion, the words Liberty, Justice, Fraternity, Love, Equality, and human exultation, all resting upon an ill-understood human dignity. It will be a tumultuous agitation, sterile for the end proposed, but which will benefit the less Utopian exploiters of the people. Yes, we can truly say that the Sillon, its eyes fixed on a chimera, brings Socialism in its train. Too bad that Francis refuses to preach the Prince of Peace (Is 9:6) to those of “all faiths” as the only genuine remedy. No, the devil does not want to “kill everyone”, at least not physically. The devil seeks the eternal ruin of souls, not the physical destruction of the body per se. All of us will die before long anyway, so our physical destruction is guaranteed (cf. Heb 9:27). It is, in fact, a divine sentence in punishment for original sin: “For the wages of sin is death” (Rom 6:23; cf. Gen 2:17). For the devil there is no need to accelerate our physical demise, at least not of those who are bereft of sanctifying grace, for the longer an impenitent soul is alive, the more sins it commits, and if it dies in this impenitence, it will have to endure an eternal punishment all the more severe. No, the devil is interested in much higher things than merely earthly destruction: “And fear ye not them that kill the body, and are not able to kill the soul: but rather fear him that can destroy both soul and body in hell” (Mt 10:28). But for a Naturalist like Francis, who preaches the “Gospel of Man”, this is all unintelligible. For him, the temporal world is all there is and all that matters. That’s why he only cares about soup kitchens, not about religious instruction. So, no, it is not necessary, as Francis maintains, “for all faiths to pray, even cry for peace” — rather, it is necessary for all souls to submit themselves to the sweet yoke of the Gospel, so that grace may flourish in their souls and, the spirit of enmity having been subdued with God’s help, true brotherly love can rule in everyone’s hearts. That would be the Catholic position. One notable occurrence in this Assisi event was that Francis denounced paganism — not, of course, the paganism of the pagans he had invited and that were gathered next door from where he was speaking, but, as usual, only a metaphorical “paganism of indifference”. Buzzwords like this are Francis’s specialty, as they make for great newspaper headlines and, being wonderfully vague, convey nothing definite and are too elusive for rigorous theological evaluation. This is the same Francis who also likes to denounce every kind of metaphorical idolatry under the sun — the idolatry of money, of ideas, of immanence, etc. — except the literal idolatry of, you know, actual idolaters, like Hindus and other Pagans. No, when it comes to that kind of idolatry, Francis’ tune changes. He then calls it “meeting God in different ways”. Bergoglio’s double standard and blasphemy are sickening. As Fr. Michael Muller once made clear, “It is impious to say, ‘I respect every religion.’ This is as much as to say: I respect the devil as much as God, vice as much as virtue, falsehood as much as truth, dishonesty as much as honesty, Hell as much as Heaven” (source). We must respect people but not their false religions. Our duty is to preach Jesus Christ to them, who said: “I am the way, and the truth, and the life. No man cometh to the Father, but by me” (Jn 14:6). He alone is the way of salvation, and His true Catholic Church alone is the ark in which everyone must gather if he wishes to be saved: “Faith orders Us to hold that out of the Apostolic Roman Church no person can be saved, that it is the only ark of salvation, and that whoever will not enter therein shall perish in the waters of the deluge” (Pope Pius IX, Allocution Singulari Quadam). That nobody in the Vatican believes this, least of all Francis, is obvious. By the way, the prophet Elias once had an interreligious encounter with 850 pagan priests, but it didn’t quite go the Vatican II way. Instead of joining up in prayer and declaring that there is more that unites than divides, Elias made it into a competition: He challenged the pagan priests to call on their false gods to send fire from heaven to consume the sacrifice they had prepared, and he would do the same before his God, and then the people of Israel would see whose god is the true one. The story is recounted in 3 Kings 18:19-39 (or 1 Kings 18:19-39 in some Bibles), and it is well worth a read. After the spirit of Assisi and the god of surprises, Francis has discovered yet another “divine being”: the “god of peace” that is supposedly adored by people of all religions. Indeed, one dogma that seemed to be shared by all the participants at the event is the idea that all “authentic religion” — whatever that is; they don’t distinguish between true and false religions — is necessarily peaceful, that it lies in the nature of religion as such to promote peace. But is that so? What is it about religion as such that should make it intrinsically peaceful and peace-promoting? Nothing, of course. It is a thesis that is simply asserted gratuitously and subscribed to by everyone because it is politically correct. It simply sounds good to assert that all religion is peaceful and that if something is not opposed to violence and war, it is not genuine religion. But simply claiming it does not make it so. It merely obscures the all-important fact that there can only be one true religion, all others being necessarily false. In essence, this is also Francis’ position. To him, as with any Modernist, all religions are more or less good and praiseworthy; and this is something he unequivocally showed in his January 2016 “Pope Video”. To say that all religions are true is not only false, it is absurd — it is like saying that just as 1 plus 1 equals 2, so it also equals 3, and 48, and 119. As absurd as it is, however, it is a central Modernist tenet, and hence Francis will be delighted with his Hindu friend’s assertion. Indeed, Modernists do not deny, but actually maintain, some confusedly, others frankly, that all religions are true. That they cannot feel otherwise is obvious. For on what ground, according to their theories, could falsity be predicated of any religion whatsoever? Certainly it would be either on account of the falsity of the religious sense or on account of the falsity of the formula pronounced by the mind. Now the religious sense, although it maybe more perfect or less perfect, is always one and the same; and the intellectual formula, in order to be true, has but to respond to the religious sense and to the believer, whatever be the intellectual capacity of the latter. In the conflict between different religions, the most that Modernists can maintain is that the Catholic has more truth because it is more vivid, and that it deserves with more reason the name of Christian because it corresponds more fully with the origins of Christianity. No one will find it unreasonable that these consequences flow from the premises. But what is most amazing is that there are Catholics and priests, who, We would fain believe, abhor such enormities, and yet act as if they fully approved of them. For they lavish such praise and bestow such public honor on the teachers of these errors as to convey the belief that their admiration is not meant merely for the persons, who are perhaps not devoid of a certain merit, but rather for the sake of the errors which these persons openly profess and which they do all in their power to propagate. During his address at the “Christian” ecumenical prayer meeting — an address in which he did not mention Jesus Christ even once, by the way — Francis threw a crumb to conservative critics of his endeavor: “Without syncretism or relativism, we have rather prayed side-by-side and for each other,” he stated. That’s it — that settles it. Francis says there is neither relativism nor syncretism going on, so there isn’t. Right? Not exactly, although he was forced to throw this one-sentence disclaimer into the mix for the sake of plausible deniability; and his apologists are guaranteed to eat it up. It is the line that will be quoted by Jimmy Akin and Tim Staples later on to exonerate Francis of the charge of heresy. But this is only smoke and mirrors, for just as an adulterer who says his illicit relations are not adultery is still an adulterer, so Francis, despite his verbal protestations, is still a Modernist, still a Naturalist, still an Indifferentist. Although what happened at Assisi may technically escape the charge of syncretism, inasmuch as no ceremonies from different religions were mixed together (except, perhaps, the “Christian” ecumenical one), nevertheless relativism is apparent throughout the event, and so is, most of all, the heresy of indifferentism. [The Bishops] shall also be on guard lest, on the false pretext that more attention should be paid to the points on which we agree than to those on which we differ, a dangerous indifferentism be encouraged, especially among persons whose training in theology is not deep and whose practice of their faith is not very strong. For care must be taken lest, in the so-called “irenic” spirit of today, through comparative study and the vain desire for a progressively closer mutual approach among the various professions of faith, Catholic doctrine — either in its dogmas or in the truths which are connected with them — be so conformed or in a way adapted to the doctrines of dissident sects, that the purity of Catholic doctrine be impaired, or its genuine and certain meaning be obscured. But then again, Francis didn’t even deny that the prayer meeting at Assisi promoted indifferentism — he only denied it promoted relativism and syncretism. Sly fellow. 18. Protestantism is nothing more than another form of the same true Christian religion, in which form it is given to please God equally as in the Catholic Church…. Francis has endorsed all of these condemned theses — sometimes more, sometimes less openly. Our Francis Page lists all the evidence. 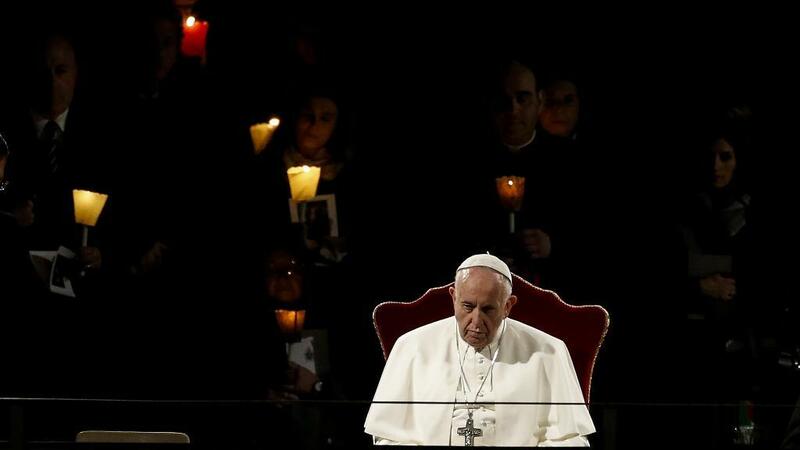 Further on in the same speech, Francis called peace “a thread of hope that unites earth to heaven”. With such flowery language, Francis has entertained the masses since his election in 2013. Quasi-poetry like this is perfect for him because it requires no theological knowledge, has no substantial content, and it is anyone’s guess as to what exactly is meant by it. At the same time, the media will eat it up because it makes for a great headline. So it’s really a win-win for the Novus Ordo cause. Just this one time, however, let us dissect Francis’ flowery slogan and see if it can stand up to scrutiny. The kind of peace being promoted and sought at this Assisi gathering was clearly not the peace only Jesus Christ can give, because all religions and none are being encouraged to obtain it in whatever manner they deem fit in accordance with their “sacred” conscience. In other words, it was a Naturalist peace, the peace “the world giveth” (Jn 14:27), not the supernatural peace only Christ can give. So this peace-without-Christ Francis calls a “thread of hope that unites earth to heaven.” But even if it were true that this peace could be attained, exactly how would it unite earth to heaven? What does Naturalistic peace on earth have to do with heaven? In what sense would there be a “unity” between heaven and earth? And what heaven are we talking about, anyway? The Christian heaven of the Beatific Vision? The Muslim heaven with the 70 virgins and perpetual fornication? The Buddhist Nirvana? The atheist’s idea of being forever and irrevocably annihilated? Just what are we talking about? Likewise, we must ask: What is meant by “hope”? In Catholicism, hope is a theological virtue which disposes us to desire and expect, with the help of God’s grace based on His infinite goodness and promises, to attain the Beatific Vision. What, pray tell, does this have to do with the Naturalist “peace” promoted by Bergoglio as supposedly uniting heaven and earth? What is there to hope for if not eternal salvation, next to which any other achievement pales in comparison and becomes utterly irrelevant? True hope exists only in the Catholic religion, not in any other. The Catholic theological virtue of hope is the true thread that unites Heaven and earth. The only thing Bergoglio’s false “peace” can unite is earth with hell. As you can see, as soon as one starts dissecting Francis’ flowery metaphors using Catholic theology and just common sense, they fall entirely apart. They are nothing but hot air — and that’s bad for the environment, as he likes to remind us on other occasions. In his final address, directed at all the participants at the Assisi event, Francis said: “We have prayed to God, asking him to grant peace to the world. We recognize the need to pray constantly for peace, because prayer protects the world and enlightens it. God’s name is peace.” Keep in mind that Francis was speaking to a group of people consisting of representatives of every major religion, including Buddhists, who do not believe in a personal God at all, as well as Sikhs, Shintoists, Hindus, and who knows what else. All this doesn’t matter to Francis. To him, “we have prayed to God.” And this prayer — whether it be to the creature or to the Creator is irrelevant to Bergoglio, for him it is prayer as such — “protects the world and enlightens it”. This is a staggering blasphemy! It should not come as a surprise, however, that the man who has explicitly declared that “there is no Catholic God” should instead believe in an uber-god common to all religions and adored by all religions — the multi-religious “god of peace”. No, Mr. Bergoglio! Jesus Christ is the Prince of Peace, He alone is King, and any other “god” is the devil! Once again, no distinction was made between true religion and false religion, between God and the devil, between what God has revealed and what the devil has made up to deceive souls. What Riccardi said is an abominable affront against the Divine Majesty, for once again God and the devil were put on the same level. Yet it stands to reason that only one religion can truly be God’s — all the others must necessarily have been created by the devil. But the devil’s work is obviously unable to generate or attain peace; it can generate a false sense of peace, perhaps, but not true peace. Jesus Christ is the “Prince of Peace” (Is 9:6); Satan is the “prince of this world” who “hath not any thing” in Christ (Jn 14:30). Our dear Lord Jesus was not mentioned by Riccardi in his closing speech at all. No, our Divine Savior had been pushed to the sidelines, for to these people He is a distraction who interferes with their man-made program of peace through dialogue rather than God’s program of peace through submission, aided by divine grace, to Jesus Christ. These people really do think that they know better than God Himself how to attain genuine and lasting peace. The blasphemy is sickening! So, “nothing is lost with dialogue”, eh? False. Souls are lost because of dialogue replacing evangelization. They may have lived a whole lifetime in peace, but the hellish eternity that awaits them is a bit longer. People can die in a war and still save their souls — this is entirely possible. But no one who is lacking in Faith when he dies because he was never evangelized can still be admitted to heavenly glory: “But without faith it is impossible to please God” (Heb 11:6); “…he that believeth not shall be condemned” (Mk 16:16). At this point, the apostasy is so advanced and so clearly out in the open that even a cursory glance at the pages of the New Testament suffices to see the contradiction between the Catholic religion and the strange new religion of Vatican II. Even Riccardi’s other assertion, that “[e]verything is possible with peace”, is wrong as well. Rather, “…all things are possible with God” (Mk 10:27). Peace will not save a single soul. Only God’s grace can do that. Which God? The true God, obviously. Hence evangelization, not dialogue, is all-important. The terrible truth is that man has long put himself in the place of God. Every time Francis prays the Our Father, he utters: “Thy kingdom come, Thy will be done…” But does he really seek God’s kingdom? Does he really want God’s will to be done “on earth as it is in Heaven”? Far from it! Instead, he works incessantly to establish a kingdom of man, a “new humanity” foreign to the Gospel, where man, not God, is put at the center. In 1900, Pope Leo XIII lamented, “The world has heard enough of the so-called ‘rights of man.’ Let it hear something of the rights of God” (Encyclical Tametsi, n. 13). His successor St. Pius X observed: “…this according to the same apostle [St. Paul] is the distinguishing mark of Antichrist, [that] man has with infinite temerity put himself in the place of God, raising himself above all that is called God…” (Encyclical E Supremi, n. 5). By contrast to the Naturalism of the Vatican II Sect, the authentic Catholic position is to “restore all things in Christ” (cf. Eph 1:10; Apoc 21:5), as Pope St. Pius X prescribed, to whom the apostate Francis claims to be strongly devoted (!). But to restore all things in Christ, the holy Pontiff explained, is nothing other than “to lead men back to submission to God” (Encyclical E Supremi, n. 8). Francis turns this on its head and makes God submit to man, as it were, for he has no use for God other than having Him forgive our sins and grant our petitions. This indeed is antichrist. Oh, the triumphalism! Sacred Scripture is clearly pre-Vatican II. Everyone, pray to Our Lady of Fatima, the Queen of Peace, in reparation for the latest Assisi abomination committed by Francis and his ecumenical, interreligious, anti-Catholic gang. Comfort and console your Loving Redeemer, that He may turn His just wrath from us and bring all men to the light and truth of the Gospel, whence alone true holiness can flourish and the peace of Christ, which is the only true peace, can fill the hearts of men and bring about the restoration of all things in Christ. “And may the God of peace himself sanctify you in all things; that your whole spirit, and soul, and body, may be preserved blameless in the coming of our Lord Jesus Christ” (1 Thess 5:23).